UC Santa Cruz is one of the 20 greenest colleges in the country, according to Sierra magazine’s “Cool Schools” ranking. Coming in at No. 18, the ranking underscored UC Santa Cruz’s strong commitment to protecting the environment, addressing climate change, and encouraging sustainability. More than 200 schools participated in the extensive survey about sustainability practices on their campus for Sierra, the national magazine of the Sierra Club. Using an updated, customized scoring system, Sierra’s researchers ranked each university based on its demonstrated commitment to upholding high environmental standards. 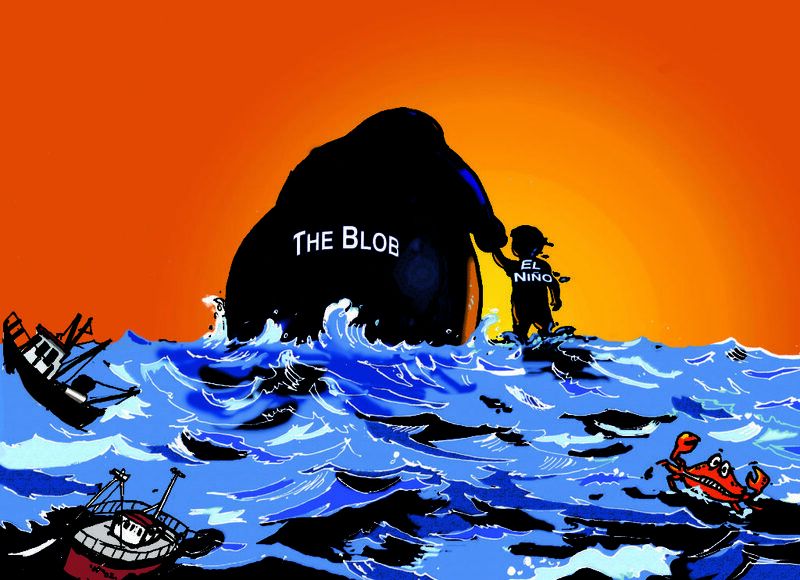 The Blob and El Nino are on their way out, leaving a disrupted marine ecosystem behind. New research indicates that the Blob and El Niño together strongly depressed productivity off the West Coast, with the Blob driving most of the impact. The research by scientists from UC Santa Cruz, NOAA Fisheries, and Scripps Institution of Oceanography is among the first to assess the marine effects of the 2015–16 El Niño off the West Coast of the United States. Off California, El Niño turned out to be much weaker than expected, said lead author Michael Jacox, a project scientist at UC Santa Cruz and NOAA Fisheries’ Southwest Fisheries Science Center. “Now, both the Blob and El Niño are on their way out, but in their wake lies a heavily disrupted ecosystem,” he said. Artist’s rendering of WiSE 0855 as it might appear if viewed up close in infrared light. 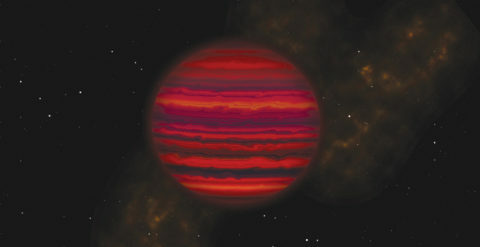 Since its detection in 2014, the brown dwarf known as WISE 0855 has fascinated astronomers. Only 7.2 light-years from Earth, it is the coldest known object outside of our solar system and is just barely visible at infrared wavelengths with the largest ground-based telescopes. Now, a team led by astronomers at UC Santa Cruz has succeeded in obtaining an infrared spectrum of WISE 0855 using the Gemini North telescope in Hawaii, providing the first details of the object’s composition and chemistry. Among the findings is strong evidence for the existence of clouds of water or water ice, the first such clouds detected outside of our solar system. “We would expect an object that cold to have water clouds, and this is the best evidence that it does,” said Andrew Skemer, assistant professor of astronomy and astrophysics at UC Santa Cruz. Radiocarbon dating and DNA analysis of bison fossils enabled researchers to track the migration of Pleistocene steppe bison into an ice-free corridor that opened along the Rocky Mountains about 13,000 years ago. Scientists using evidence from bison fossils have determined when an ice-free corridor opened up along the Rocky Mountains during the late Pleistocene. The corridor has been considered a potential route for human and animal migrations between the far north (Alaska and Yukon) and the rest of North America, but when and how it was used has long been uncertain. 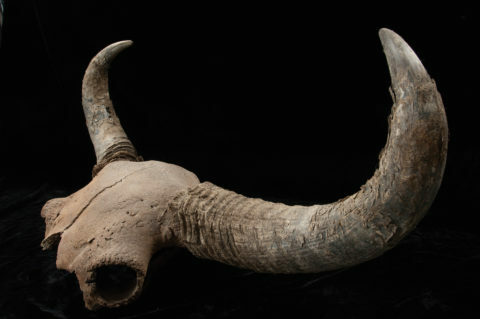 The researchers combined radiocarbon dating and DNA analysis to track the movements of bison into the corridor, showing that it was fully open by about 13,000 years ago. Their findings indicate that the corridor could not account for the initial dispersal of humans south of the ice sheets, but could have been used for later movements of people and animals, both northward and southward. The initial southward movement of people into the Americas more than 15,000 years ago now seems likely to have been via a Pacific coastal route, but the Rocky Mountains corridor has remained of interest as a potential route for later migrations. Zhang Tao, who received his master’s and Ph.D. degrees in international economics from UC Santa Cruz, has been appointed deputy managing director of the International Monetary Fund. The IMF, based in Washington, D.C., is made up of 189 countries, working to foster global monetary cooperation. Its primary purpose is to ensure the stability of the international monetary system. Why is studying the humanities—history, literature, languages, philosophy, culture—important? How would you convince your parents, an employer, a politician, or others that there is value in pursuing the humanities? Those were the questions posed to students across the country by a new contest in response to recent media reports of pessimism about studying the humanities. Sponsored by 4Humanities.org, the competition encouraged undergraduates to make the case for the importance of the humanities in any medium or format for a public audience. The contest was run by Alan Liu, a professor of English at UC Santa Barbara. The UC Santa Cruz team of The Gail Project took first prize for Do You Have a Passport?, an essay/memoir about the project written by team member Stella Fronius (Merrill ’16, history). UC Santa Cruz students showed strong support for the campus’s NCAA Division III athletics program, with 63 percent of voting undergraduates signaling in a May election that they would be willing to establish a new fee. A record 43 percent of undergraduates voted in the election. Of those, 63 percent were in favor of establishing a new undergraduate fee that would be approximately $90 per student per quarter. Undergraduate students will vote in spring 2017 on establishing a new student fee. Additionally, two committees—one composed of faculty and one composed of UC Santa Cruz Foundation board members and alumni councilors—are looking at sustainable funding models for the program. UC Santa Cruz offers NCAA Division III athletic teams in men’s and women’s basketball, cross-country, soccer, swimming/diving, tennis, and volleyball; and women’s golf and track. All the teams will continue to compete next year. Barbarian William Finnegan surfing in Thailand. Two UC Santa Cruz alumni were among this year’s winners of the Pulitzer Prize, journalism’s highest honor. Martha Mendoza (Kresge ’88, independent major, journalism and education) was part of the Associated Press team that exposed the use of slave labor in the Thai seafood industry. William Finnegan (Cowell ’74, English literature), a New Yorker staff writer since 1987, won for his memoir of surfing, Barbarian Days: A Surfing Life. It’s the second Pulitzer for Mendoza, an AP national reporter since 1995 who is also a visiting lecturer in the UC Santa Cruz Science Communication Program. She won in 2000 for investigative reporting. She is also the second UC Santa Cruz alumna to win two Pulitzers. Dana Priest (Merrill ’81, politics) won in 2006 and 2008 while at the Washington Post. 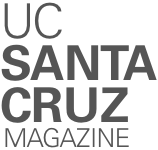 UC Santa Cruz now has six winners of eight Pulitzers. Previous alumni winners are Laurie Garrett (Merrill ’75, biology), with Newsday; and Hector Tobar (Oakes ’85, Latin American studies/sociology) and Annie Wells (Rachel Carson College [formerly College Eight] ’81, individual major), both of whom were with the Los Angeles Times. Drawing on four decades of archival research on five continents, the website Voyages: The Trans-Atlantic Slave Trade Database offers free public access to the details of every documented slave-trading voyage that carried enslaved people from Africa to the Americas. But recent research has shown that approximately 25 percent of arriving Africans actually soon boarded another ship for distribution within the Americas. Now with the help of a $220,000 grant from the National Endowment for the Humanities, O’Malley plans to add his research to the Voyages database, which has helped scholars understand the massive scale of the slave trade. Five UC Santa Cruz students will team with UC Santa Cruz faculty and staff to improve campus and community food systems as part of the UC Global Food Initiative’s fellowship program. Three graduate and two undergraduate students have received $4,000 UC Global Food Initiative (GFI) Fellowships for the 2016–17 academic year, and will be involved in ongoing GFI projects at UC Santa Cruz. These include efforts to improve student food security, expand experiential learning opportunities, and disseminate information on the campus’s work in agroecology. Graduate students Keli Benko (sociology), Hamutahl Cohen, and Emily Reisman (both environmental studies), and undergraduates Cassidy Carmichael (Rachel Carson College [formerly College Eight], environmental studies) and Anne Wiesenfeld (Stevenson ’17, environmental studies, literature minor) are part of a cohort of GFI fellows from throughout the UC system who are advancing work to increase food system sustainability and improve food access and nutrition at the state, national, and international levels. StoryCruz, UC Santa Cruz’s oral storytelling project, captures UC Santa Cruz voices and stories in our very own podcast. Find StoryCruz on Soundcloud. Recent StoryCruz interviews include “Smithies” in conversation with the founder of the Smith Renaissance Society talking about an emotional juncture for the organization, graduate students describing their work at the Graduate Research Symposium, and Slugs talking about how it feels to “come home” to campus for Alumni Weekend. Time magazine reached out to 25 historians and asked them to nominate a pivotal moment in history that has changed our nation. The result is a story titled “25 Moments That Changed America,” which includes short essays—based on interviews with each historian—explaining why their moment was selected. One of the distinguished historians Time contacted for the piece was UC Santa Cruz humanities dean Tyler Stovall, who is also currently president-elect of the American Historical Association. Stovall chose for his moment: Busing is Mandated in Boston (June 21, 1974). He said that he chose that moment because it seemed to mark a transition between the push for integration that accompanied the Civil Rights Movement, and the resistance to it that has resulted in the re-segregation of American schools today. She went to work helping write software that turned the $12 million telescope into a robotic version of herself. It became the first automated planet finder in the world. Burt won a post-doc fellowship at the Massachusetts Institute of Technology and hopes to work on a NASA project aimed at discovering more about these so-called extrasolar planets or exoplanets.